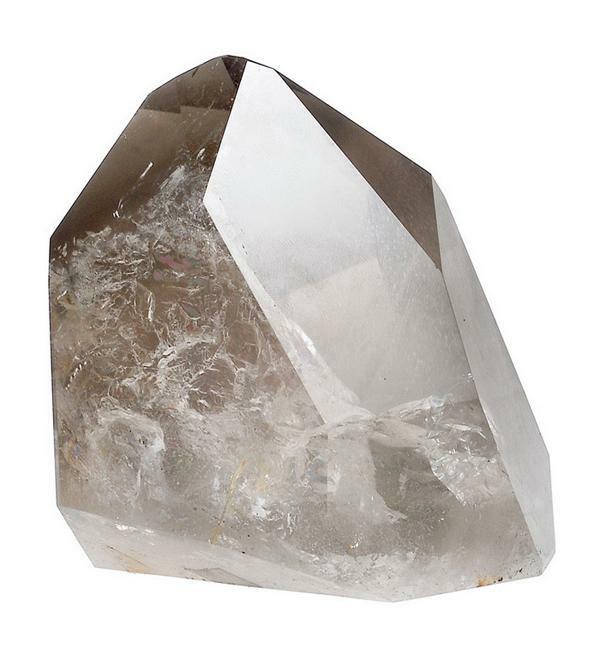 Lushome presents a new home design inspired by the elegant beauty of quartz stones. 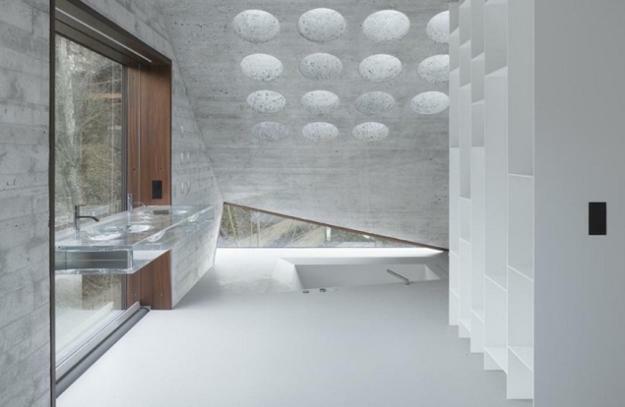 The concrete and glass house features a rock crystal shape and shows off its monolithic concrete structure, glass walls, and large windows. 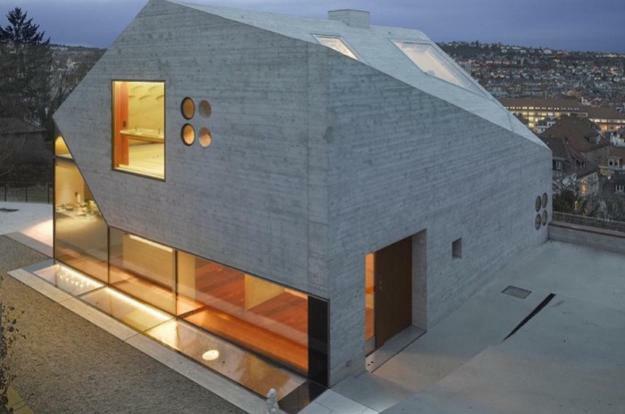 A combination of concrete and glass give a dramatic and contemporary feel to the modern house blending with the majestic mountains surrounding the site. 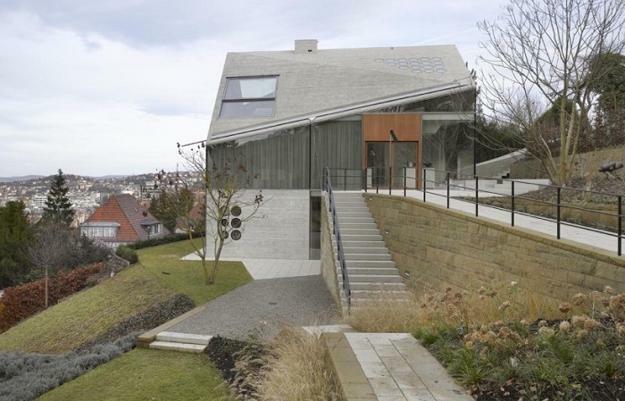 Envisioned by Matthias Bauer Associates, www.mbas.de/, this beautiful modern house is built in Stuttgart, Germany. This architectural design is impressive, innovative, and unusual. Beautifully balanced by the transparent and reflective nature of glass, the House 36 looks beautiful on the steep hill overlooking the valley and mountains. It offers spacious and contemporary interiors which have a futuristic vibe. Perfect for a modern lifestyle, the home interiors with inclined walls and triangulated roof look extravagant but functional and comfortable. The striking geometry, large glass elements, and panoramic views brighten up the rock-hard structure. This modern house provides stylish and exclusive living spaces. Large openings invite natural light, harmonize the open interior design and balance the dimensions. Glass elements romanticize the interiors merging them with the surrounding landscape and creating a fabulous connection with outdoor living spaces. The modern house design features porthole windows that make home interiors look unique and bright while keeping them private and comfortable. The bathroom design is sensational. A sunken bathtub, incredible glass wall design, and dramatic sinks create an intense play of light and shadow, give character to the bathroom design and fill the space with positive energy. 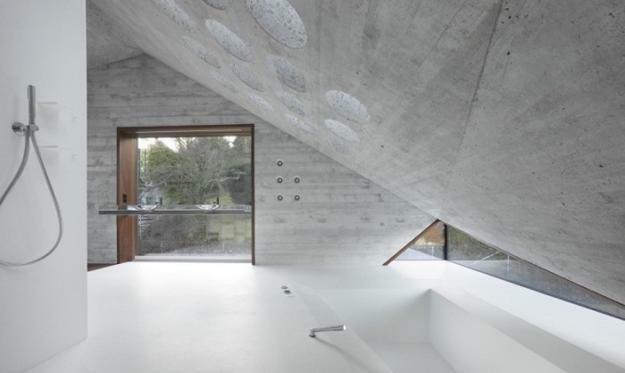 Concrete and glass are a modern combination of materials that look magnificent with sustained wood and local stones. 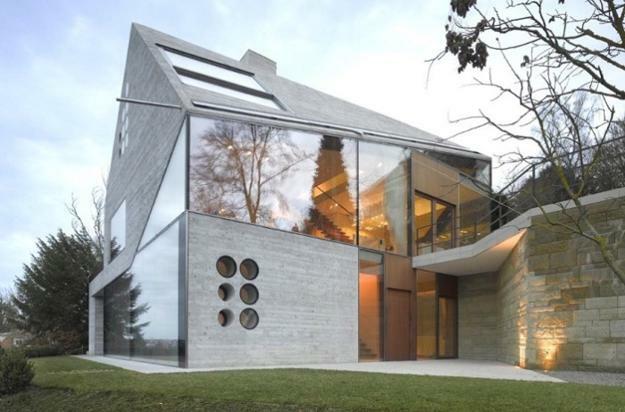 Extensive glass and angled elements create a superb design with a futuristic appeal. This modern house is a creative blend of natural materials, geometric shapes, and simple lines, that are united in harmony to create the unique, beautiful and Green home. Rough concrete surfaces and natural textures of racks enhance masculine energy while warm wood elements balance gray color tones and add warmth to contemporary architecture and interior design. Natural stones connect the old and new worlds accentuating the durability of concrete and emphasizing the fragility of glass. Modern home interiors have a light and comfortable feel which is not typical of contemporary architectural designs. Warm wood details, round windows, and striking glass walls make this attractive house look like a rock crystal showing the natural grace and power.